Russia has offered Indonesia the opportunity to carry out trade settlements in national currencies, Industry and Trade Minister Denis Manturov said just a couple of days after Prime Minister Dmitry Medvedev made the same offer to Vietnam. "We hope the proposal will be actively supported by you. We already have experience with that kind of thing with India, and China. We are discussing this topic with Vietnam and Thailand,” Manturov told his Indonesian partners during the 10th session of the Russian-Indonesian Intergovernmental Commission on Trade, Economic and Technical cooperation. He added that this would strengthen both countries’ local currencies and give an opportunity to work without dollars and euro. Trade between Russia and Indonesia is estimated at $2.5 billion in 2014. The countries plan to double the figure to $5 billion in 2016. 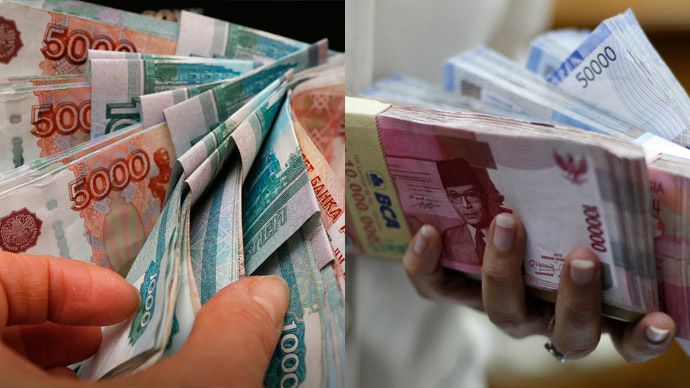 "The dependence on the dollar is our common headache," said the Indonesian Coordinating Minister Sofyan Djalil adding that Indonesia is willing to consider mutual trade in national currencies. Although at first there may be difficulties in implementing this idea, they can be solved at this stage while trade is not very big, he added. Russia's proposal will be discussed at a meeting of working groups of the Bank of Russia and the Central Bank of Indonesia. "I am sure we will be able to implement the project with a serious integrated approach," concluded Djalil. On Tuesday Russian Prime Minister Dmitry Medvedev suggested to his Vietnamese counterpart that both countries should start using their domestic currencies in bilateral trade more actively, saying it would help boosting economic relations.